Magazine UX, we hardly knew ya! Following the announcement earlier this week that Google and Samsung will be licensing each other's patents, new details have come to light suggesting the Android maker might be influencing the manufacturer to back off its own customizations. 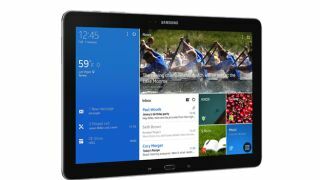 Re/code reported today that the Android-based Magazine UX user interface shown off on Samsung's latest 12.2-inch Galaxy Note Pro tablet could be marked for death - or at the very least, in dire need of future tweaking that makes the OS underneath shine through. According to multiple unnamed sources, the recent patent sharing deal between Google and Samsung also involves a directive from the former which reins in the number of custom apps and UI flourishes the latter has added with increasing frequency on recent mobile devices such as the Galaxy S4 smartphone. Representatives from the two companies refused to comment on such a possibility, although Samsung did promise it would "continue to identify and provide differentiated and innovative service and content offerings on our mobile devices." The newfound cooperation between the companies was described by one source as "a huge change, a sea change" made over the last few weeks which could put Google's content and services more front and center at the expense of Samsung's own. Sources claim the Korean manufacturer may "consider dumping or altering the Magazine UX interface in future devices," with a reduced focus on the in-house software that has been an increasing focus for the company. In its place, Samsung might shine the spotlight on preloaded Google Play apps, replacing services like WatchON, ChatON and mSpot, which the report called "largely forgettable in the wider Android community." Samsung may not ultimately care, but third-party partners such as Dropbox, Flipboard, SwiftKey and TripAdvisor likely will, given that their services have been bundled with devices out the box and Google has its own software capable of replacing them. Let the Android light shine in our review of the Motorola Moto G!